September 24, 2014 – NASA’s Mars Atmosphere and Volatile Evolution (MAVEN) spacecraft has obtained its first observations of the extended upper atmosphere surrounding Mars. The Imaging Ultraviolet Spectrograph (IUVS) instrument, built by the Laboratory for Atmospheric and Space Physics (LASP) is Boulder, obtained these false-color images eight hours after the successful completion of Mars orbit insertion by the spacecraft at 10:24 p.m. EDT Sunday, Sept. 21, after a 10-month journey. The image shows the planet from an altitude of 36,500 km in three ultraviolet wavelength bands. Blue shows the ultraviolet light from the sun scattered from atomic hydrogen gas in an extended cloud that goes to thousands of kilometers above the planet’s surface. Green shows a different wavelength of ultraviolet light that is primarily sunlight reflected off of atomic oxygen, showing the smaller oxygen cloud. Red shows ultraviolet sunlight reflected from the planet’s surface; the bright spot in the lower right is light reflected either from polar ice or clouds. The oxygen gas is held close to the planet by Mars’ gravity, while lighter hydrogen gas is present to higher altitudes and extends past the edges of the image. These gases derive from the breakdown of water and carbon dioxide in Mars’ atmosphere. 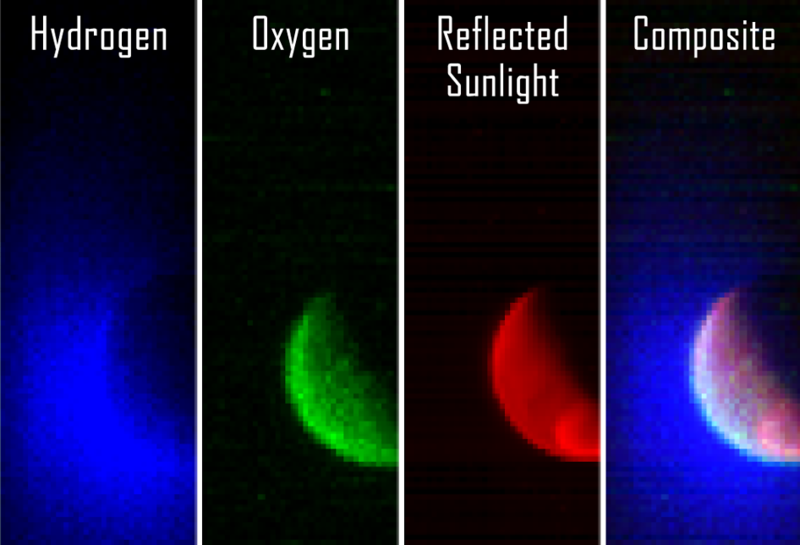 Over the course of its one-Earth-year primary science mission, MAVEN observations like these will be used to determine the loss rate of hydrogen and oxygen from the Martian atmosphere. These observations will allow scientists to determine the amount of water that has escaped from the planet over time. MAVEN, built by Lockheed Martin, is the first spacecraft mission devoted to exploring the upper atmosphere of Mars.